The teaser of Kabir Singh, a remake of superhit Telugu flick Arjun Reddy, has been released worldwide earlier this week. The promo has been garnered with unimaginably positive reviews and appreciation. In fact, South superhero Prabhas too reacted after watching Kabir Singh’s marvellous trailer. Starring Shahid Kapoor, the film is generating high expectations in both North and South audiences. Prabhas has reportedly told Shahid that the film looked ‘better than the original’. In the original version, Arjun Reddy (Telugu), Vijay Deverakonda was seen doing the lead role and went on to become an overnight heartthrob. The South actor, after watching the teaser, expressed his love towards Shahid’s exceptional acting. “Seeing Prabhas’ reaction to the promo, I called up Shahid and handed him the phone. 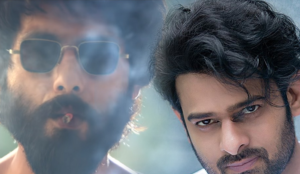 Prabhas appreciated the actor and said that Kabir Singh looks even better than the original. Both of them chatted for a good seven-odd minutes,” he added. Previous articlePawan Kalyan Contests From Tirupathi?